I started this particular blog as a way to give back to a lifestyle that I’ve lived for ten years as a journey into a new hair choice of Locs. I am in the very early stages of this blog so to be nominated for anything means that someone is reading, and for that I’m grateful. This blog started as a way to keep all the tips & tricks I’ve learned in one place so that when my friends and family had questions they’d get an answer they could keep track of. However, after the first few international hits, I’m working on building a team of experts. 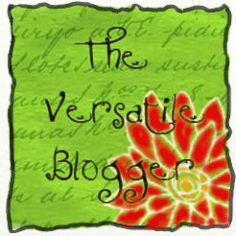 Nominate 10 fellow bloggers relatively new to blogging Let the nominated bloggers know that they have been nominated for this award Share 7 random facts about yourself Thank the blogger who has nominated you Add the Versatile Award picture to your post. 1. I’ve got OCD and 7 is one of my numbers so I’m grateful that’s the requirement. 2. I’m a jewelry lover, but I’ve curbed my collection as a result of losing so many pieces in my multiple moves around the country. 3. I have two favorite colors, Blue and purple. 4. I once had a dog named Hannibal that was a Jack Russell Terrier. 6. Reading and writing are both my hobbies and profession. 7. I make a mean pound cake, thanks to my Grandmother’s recipe. Again, I revert back to the fact that I’m new, so I’ll add a few more people as I get around and read more.